Almonds are technically seeds of the fruit from the almond tree. Almond trees are medium sized and have beautiful fragrant pink and white flowers. Like its cousins, the peach, cherry and apricot trees, the almond tree bears fruits with stone-like seeds (or pits) within. 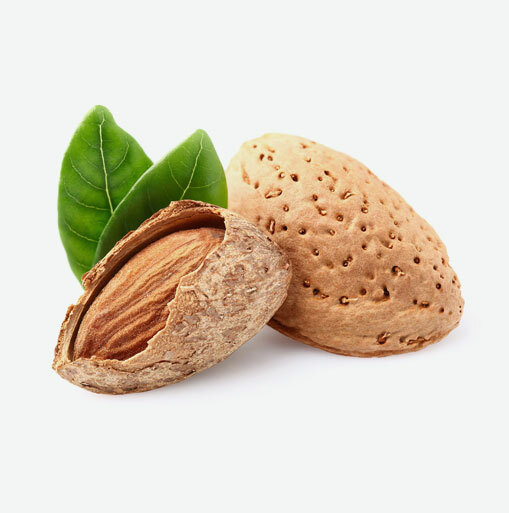 The seed of the almond fruit is what we refer to as the almond nut. Almonds are creamy, off-white in colour and covered by a thin brownish skin which is encased in a hard shell. There are two kinds of almonds: bitter and sweet. Sweet almonds are the type that is eaten. They are oval in shape and have a creamy, buttery taste. They are available in the market either still in their shell or with their shell removed. Shelled almonds are available whole, sliced or slivered in either their natural form, with their skin, or blanched, with their skin removed. Bitter almonds are used to make almond oil that is used as a flavouring agent for foods and liqueurs such as Amaretto. They are otherwise inedible as they naturally contain toxic substances such as hydrocyanic acid. These compounds are removed in the manufacturing of almond oil. Almonds were thought to have originated in regions in western Asia and North Africa. In the 1800s, almond trees were brought over from Europe and were first planted in New England but the climate on the Eastern seaboard did not support their cultivation and the trees were brought to California where they thrived and continue to do so. Data collected from over twenty years of studies indicate that women who eat least one ounce of nuts such as almonds each week have a 25% lower risk of developing gallstones. Almonds are concentrated in protein. A quarter-cup contains 7.62 grams of protein which is more protein than the typical egg delivers which is about 5.54 grams of protein. Further research shows that eating almonds along with a high glycemic index food significantly lowers the glycemic index of the meal and lessens the rise in blood sugar after eating. This is good news for people who need to watch their glucose levels. Almonds that are still in their shells have the longest shelf life. If purchasing these, look for shells that are not split, moldy or stained. Shelled almonds that are stored in a hermetically sealed container will last longer than those that are sold in bulk bins since they are less exposed to heat, air and humidity. Look for almonds that have an even colour. Avoid almonds that are limp or shriveled. In addition, smell the almonds. They should smell sweet and nutty; if their odour is sharp or bitter, they are rancid. If you want almonds with a roasted flavour and texture, choose those that have been “dry roasted” as they are not cooked in oil like their regular roasted counterparts. Yet, even when purchasing “dry roasted” almonds, it is important to read the label to be sure that no additional ingredients such as sugar, corn syrup or preservatives have been added. Since almonds have a high fat content, it is important to store them properly in order to protect them from becoming rancid. Store shelled almonds in a tightly sealed container, in a cool dry place away from exposure to sunlight. Keeping them cold will further protect them from rancidity and prolong their freshness. Refrigerated and frozen almonds will keep for several months. Almonds are not just a snack in between meals. Spread a little almond butter on your toast or down the center of a stalk of celery. Add a handful of lightly roasted almonds to your salad. Chop some almonds and sprinkle as a topping on pasta that’s steamed with healthy vegetables. When eating foods with a higher glycemic index, including almonds in the meal can help keep your blood sugar under control. Add almonds to your baking or simply put some on a cookie sheet and roast in a pre-heated oven at 400 F. for about 12 minutes. Check often to make sure that almonds do not burn. Remove from heat and let cool.